Hundreds of Indian-Americans gathered in various US cities to mourn the killing of over 40 Indian soldiers in one of the worst terror attacks in Jammu and Kashmir's Pulwama district. 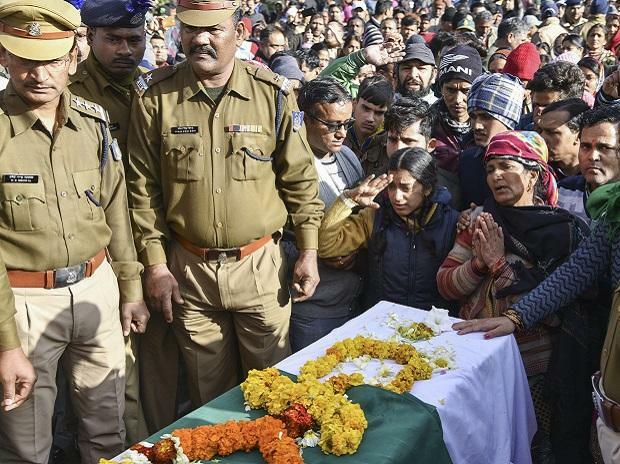 At least 41 Central Reserve Police Force (CRPF) personnel were killed on February 14 in a suicide attack claimed by Pakistan-based Jaish-e-Mohammad (JeM) terror group. Expressing their outrage, hundreds of Indian-Americans gathered at the 9/11 memorial on the outskirts of Chicago on Sunday and urged that all nations need to stand together with India and the US in their fight against those carrying out such "heinous crimes". In a joint resolution read out on the occasion, the participants held peaceful candle light protest in Naperville, Illinois and called upon Pakistan to "end immediately" support to all terrorist groups operating from its soil. "We mourn the loss of 40 Indian security personnel at the hands of terrorists. This was an act of terror, an act of pure evil. We must be firm in the face of evil and terror," said Indian-American Congressman Raja Krishnamoorthi in his address. "The threat of terrorism is not stronger than either the will of the Indian people, the American people or the people of the world. Our will is stronger. We will deal firmly with terrorism. We will deal firmly with sponsors of terrorism. In this year of the 150th birth anniversary of Mahatma Gandhi, we will continue to be people of nonviolence, peace and we will continue to open our arms to those who seek to engage with us peacefully," he said. "We will defend ourselves, but we will not change our own character," Krishnamoorthi said. Similar events were held in Washington DC, New York, New Jersey, Silicon Valley, Los Angeles, Detroit, Tampa, Houston, and Phoenix. Participants of the candle light protest urged the Indian government "to take steps to severely punish" the JeM and other terrorist organisations. Expressing solidarity with people of India and with the government, the diaspora demanded that the UN designate JeM chief Masood Azhar a global terrorist. Today the Indian community is grieving for those who have been killed and wounded in this inhuman attack, said Krishna Bansal, one of the organisers. The Naperville event was organised by the Indian Community Outreach Organization. As many as four events have been organised in and around Chicago area, which has one of the largest concentrations of Indian-Americans in the US. Later this week, the Indian-American community has organised a peaceful protest outside Pakistani and Chinese communities in Chicago. Similar events were reported from other cities of the country. Indian students in the University of Maryland in a statement said that they "strongly condemn this dastardly attack and mourn the loss of life and extend our heartfelt condolences to the victims' families and people of India". As a mark of solidarity and respect to the slain soldiers, various student organisations in the university have come together to organise a silent candle light vigil on February 21. Several temples in the Greater Washington Area held prayer meetings for the victims of the Pulwama terrorist attack. Scores of Indian-Americans gathered in front of the US Capitol Sunday morning in support of India and to express their outrage at the continuing support to terrorist groups by Pakistan. "We gathered on the lawns of Capitol Hill to offer our Shraddhanjali to martyred Heroes of Pulwama Terrorist Attack," said Adapa Prasad from the Overseas Friends of BJP-USA. "The Indian Diaspora has profusely thanked President Trump's and his administration's unequivocal stand against terrorism which is emanating from Pakistan. The community also expressed gratitude and thanked the National Security Advisor John Bolton's statement on Indian's right to self-defense and help India in these difficult times," said Krishna Reddy of the Overseas Friends of BJP-USA. A prayer meeting in memory of the slain soldiers is being planned in Edison, New Jersey.